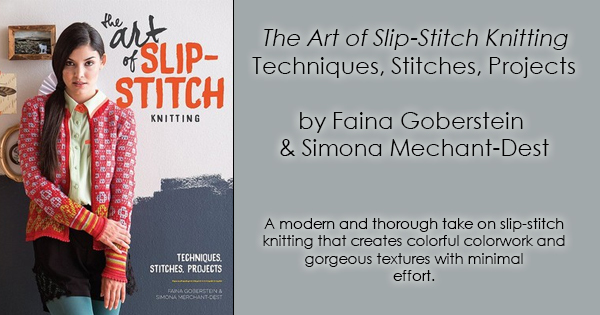 The Art of Slip-Stitch Knitting by Faina Goberstein and Simona Merchant-Dest arrived recently and this book is not to be missed. Slip-stitch knitting is a simple and versatile technique that can be used to create stunning projects that look a lot more complicated than they are. Create stunning colorwork, amazing texture, and more. The Art of Slip-Stitch Knitting includes a complete overviews of all of the basics of slip-stitch knitting. Stitch formation, reading charts, customizing stitch patterns, selecting yarns, and tips for designing are all included in this book. 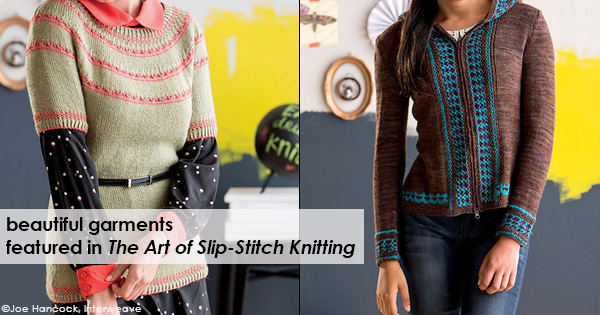 Not only that, you’ll also find 16 patterns for garments and accessories that use slip-stitch knitting. The Fialka Boot Toppers look like complicated Fair Isle, but there are worked in a fairly simple slip-stitch pattern that plays with the placement of stitches, how floats are carried, and color changes. It’s super easy to customize for your favorite color, too. The Šiška Hat looks like a complex cable, but instead it is made up of crossed slip stitches. The reverse is a basketweave pattern, so you get two hats for the price of one. It’s knit in Malabrigo Worsted, so you know it’s super soft, and this one may end up the next project on my needles. 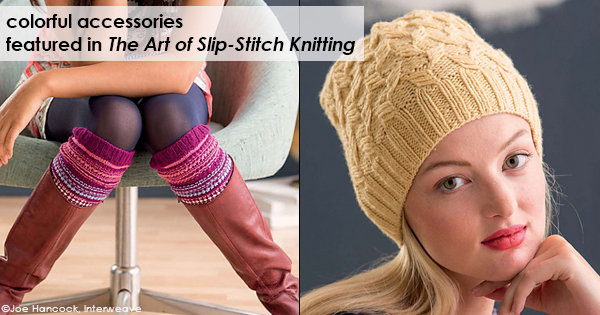 Not only will you find great accessories, like those above, The Art of Slip-Stitch Knitting also includes gorgeous garments. I’m a big fan of hoodies, and with a finished size range of 36 ½” – 57 ¼” the Kromka Hoodie would fit an array of sizes. The body of the sweater is worked in a single color in stockinette stitch, and the cuffs and front bands are worked in a two-color slip-stitch pattern, with a different two-color pattern at the hem. It’s colorful without being overwhelming. The Koketka Sweater is a classic yoke sweater knit in the round from the bottom up. There is a two-color slip-stitch pattern on the edges as a border, and another slip-stitch pattern is used on the yoke. This pattern teaches you how to shape without disturbing the pattern, and it’s a beautiful option knit in Blue Sky Alpacas Alpaca Silk. Whether you’re new to slip-stitch knitting, or already a fan, The Art of Slip-Stitch Knitting is definitely a book to pick up for you bookshelf, and explore these great techniques.